A small team of twelve people has developed an auto transformable light aircraft “AeroMobil 3.0”. Which has been officially presented at the Pioneers Festival held in Vienna. A meeting held in the Austrian capital to show the latest proposals focused on business, technology and innovation. The actual flight tests finished last October and the AeroMobil 3.0 is already a definitive model. Ready to start after necessary tests to obtain European certification in the category M1 (LSA). Definitive step for its mass production and subsequent commercialization. 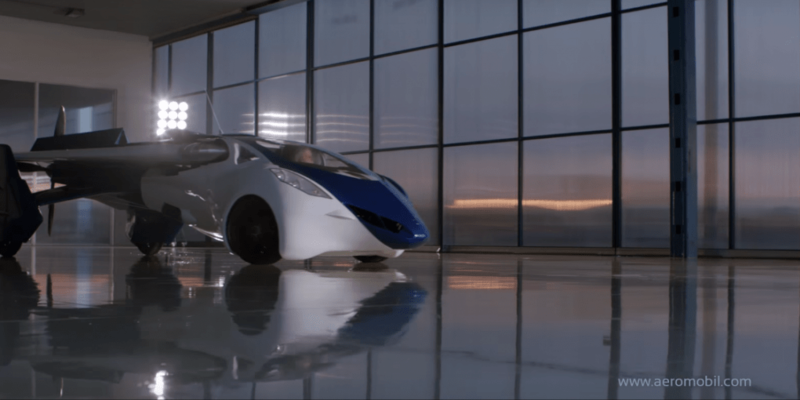 The Slovakian company AeroMobil confirmed at the SXSW festival in Texas in the United States its plans to have a version of its flying car available in 2017. This would be the first vehicle of its kind to be sold. However, for now there is no clarity of what price the car could have. The company’s CEO, Juraj Vaculilk, has estimated a price for the 3.0 version of the vehicle of at least two hundred thousand euros and has explained that it will be manufactured at first in limited units, according to Engadget. Here we have talked about other times Aeromobil, a kind of flying car capable of reaching 160 km / h on land and 200 km / h in flight with autonomy for 4 hours. The inventor of the device, Stefan Klein, tried to fly in Slovakia on a test flight but crashed. Fortunately Klein was saved. The vehicle with Klein at the controls took off from the air club of Nitra, in Slovakia. Witnesses say that the flying vehicle began to collapse very fast by turning on itself. Klein was able to activate the vehicle’s parachute, which helped dampen the impact. He was taken to a hospital after the accident, but was released within a few hours as no injury occurred. A look at the photos of the accident shows that the impact was actually quite strong. The accident is a major setback for one of the projects that so far had shown that a flying car was possible. Both from the economic and technical point of view. The company even had plans to start selling the vehicle in 2017. In a statement, the firm says they will analyze in detail what happened and that the data will serve to improve the prototype. Do not give up. The reality is that, after the accident, it will be difficult for anyone other than their own inventor, Stefan Klein, to want to ride something like perfect. The initial model would be two-seater, with hybrid engine and would have an autonomy of about 700 kilometers. The construction materials will be light and resistant, which makes manufacturing more expensive. One of the main issues that arise is that of regulation. This first two-seated version of AeroMobil 3.0 could enter into the category of light sport aircraft and thus fit into the existing regulatory framework, requiring a special license. The company works to meet safety standards and imagines a kind of aerodrome with service stations from which they can take off their vehicles that would also circulate by road. The company goes further and thinks about the next generation. In the future, in the same line that other multinationals like Google bet, the vehicle will not need to be driven, but, in addition to flying, it will be automatic. The AeroMobil 3.0, in its automotive facet, is comparable to a saloon of high range and its exterior dimensions allow you to park in the conventional squares. Once its wings unfold, it becomes a small two-seater aircraft, with all the necessary elements in avionics. It has among other autopilot systems and a parachute that also unfolds automatically if necessary. The engine runs on gasoline, which can be refilled at any service station. The Aero Mobil 3.0 is intended for businessmen and executives who need to move efficiently between cities in an autonomous and fast way. The carbon fiber wings and its Rotax 912 engine allow the AeroMobil 3.0 to reach in flight a speed of 200 kilometers per hour. Take-off and landing do not require sophisticated flight fields, which can be done on uneven terrain such as land or grass. The history of the AeroMobil Company is not short since it was founded by Stefan Klein in Bratislava in 1989, with the aim of exploring design and technology applied to new solutions for personal transport. The prototype forerunner now introduced, the AeroMobil 2.5 has already achieved flight certifications in the ultra-light category of the Slovak administration in 2013 and official recognition at the SAE 2013 AeroTech Congress & Exhibition in Montreal, Canada. It seems that what proposed the film ‘Back to the Future’ 26 years ago will soon become a reality; A flying car that, experts say, would be a good solution for those developing countries that cannot afford to invest in roads or other infrastructure.